born bibliophile: Can You Handle the Truth? Some books change your life, and some books are good at commenting on life. I would say that Nick Hornby's Juliet, Naked is the latter. Hornby is a good writer, and I enjoy his no nonsense, "here's the truth about life" approach to his story. His truths aren't shoved up in your face, it's more like subtle hints that lead you along a path. Halfway down the path, you realize you recognize it all too well. We all know someone like one of the characters, or...we are like one of the characters. Juliet, Naked is an enjoyable read that looks at the lives of a washed up rock star from the 80s, a man who is obsessed with the former rock star, and a woman who wonders how she fits in the picture and fears her life is going nowhere. The story line isn't earth-shattering, but it's comfortable and recognizable to those of us who have lived long enough to look back and wonder how we ended up where we are. Like Hornby's High Fidelity, this novel also speaks about the power of music and the fanatical fans who use the internet to obsess together over favorite artists, favorite albums, and hidden meanings in lyrics. It also says something about the people we choose to love, fractured families, and the importance of knowing yourself. In other words, Hornby takes a sarcastic, humorous, and sad look at the state of the world and the people who live in it. It is forgiving and understanding, though, in a way that made me nod my head and sigh, "Yes, we are like that, aren't we? When will we learn..."
If you're a realist and an avid reader, I think you'll like it. If you're not an avid reader and pretty picky about what you read when you find the time, this book really isn't for you. I'm just being honest. I know a lot of people who might find this book a bit depressing or would prefer to read something that takes them out of the reality of their every day lives. This book makes you look at every day life, and what makes us all human. It's a good book, but I'm aware it isn't for everyone. I hate it when I find myself reading a book that makes me remember something I'd be better off to forget, but...I still really like the book. Just so you know, this wasn't the book I was talking about. I had already written the draft for this post before I started another book last night. I prefer to write about a book as soon as I finish it unless "mulling it over" time is needed. 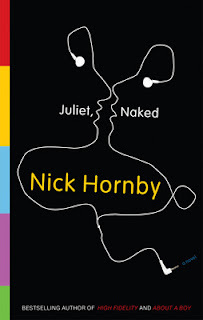 It wasn't needed with Juliet, Naked and, once I was finished with it, I jumped right into another book. I was wondering about your facebook comment. The blog about this book and your post didn't exactly mesh. :) Looking forward to hearing about the book the post was written for. "We are not always what we seem..."